Engelberg quite literally translates to "Angel Mountain." Legend has it that in 1120, the founders of a local monastery heard the sound of angels coming from the top of the Hahnen. (At 2600 meters above sea, this mountain overlooks what today is the Engelberg Valley.) They took it as a sign that they should build their church on the site from which they heard the heavenly hymns. And this is where the town got its name. The monastery eventually gained a reputation for the high quality of education that students received there. But after the last Winter Olympics in Pyeongchang, South Korea, attention has turned from its Stiftsschule to a small private school in Engelberg. That's because the Swiss Sports High School Engelberg (Schweizerische Sportsmittelschule) has produced more Swiss Olympians than any other school. Sixteen to be exact. So while you may not find any mythical angels there, you will see numerous people resembling angels - and others flying down the mountains or gliding over snow like them! I recently had the opportunity to visit the Sports High School in Engelberg. Eskil Läubli, head director of the school, greeted me upon arrival. A former athlete himself, Eskil's blue eyes flash with a passion for what the school is doing and the success of its students. On this Friday in late February, the school is almost empty with many students on break or at competitions around Europe. In the first room we enter, there is a class of six using wind resistance machines to exercise their arms and upper body. The Russian devices help simulate the action on pushing off with ski poles when cross-country skiing. The gym is sparingly decorated but perfectly organized. "Nur im Wörterbuch kommt Erfolg vor Fleiss" is printed on the wall leading to the gear room: "Only in the dictionary you will find success before work." When asking the students why they are at the school in the first place, they tell me that they want to be there. They love sport and they want to excel in it. Furthermore, the school's infrastructure, teaching staff and curriculum provide them with the best opportunities to train and be at the top of their game while also shining academically. It is also clear that the students, like Eskil, believe that to be the best, you need to train with the best. 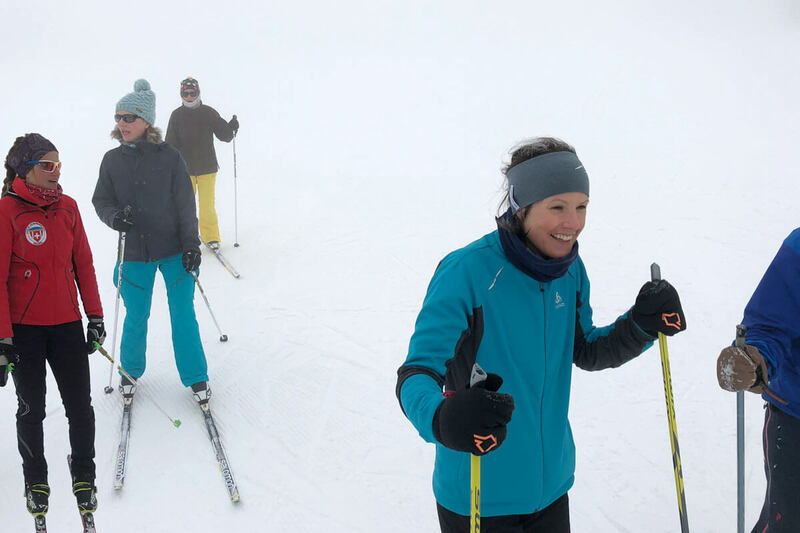 With two current students competing in free-skiing and fourteen former students in disciplines like cross-country, biathlon, alpine, snowboard, freestyle snowboard and ski cross, the Schweizerische Sportsmittelschule is where the best train and challenge each other. The gymnasium is set up with a track of trampolines and ramps. Here, another guiding principle is emblazoned on the wall: "If you can dream it - do it." Living this theme is Andri Ragettli, one of the school's current students and a social media celebrity. Ragetti first gained attention for a Parcours challenge in 2016 and has not stopped since. A former student, Fabian Bösch, also received international attention with his Instagram video hanging on to the rails of an escalator and going up on the outside: If you can dream - do it. In Engelberg, I also get to cross-country ski with Lena Häcki, a Swiss Olympian in biathlon and a former student of the school. We use the skating style, which is really difficult. While cross-country skiing may be less dangerous than downhill skiing, it is hard. It requires leg power, arm power and balance. Two minutes into my lesson, I fall over. I have a feeling that this will happen again and again. Fortunately, it only happens once more. I practice gliding, which is hard, too. After an hour and a half which feels like an eternity, we call it a day and go for lunch. Over a plate of roasted beef and Schupfnudeln (finger-shaped potato dumplings), Lena recalls her time in South Korea. She also conveys what it is like to be in the biathlon, going at full speed at top cardio conditions and then getting to your shooting station and needing to get your heart rate down and stop jittering for a clean shot. Action and inaction, endurance and concentration. After listening to Lena, I have a new appreciation of biathlon. In South Korea, Lena competed in six events and placed in the top eight in two of them. With these results, she came home with two Olympic Diplomas. In total, the sixteen current and former Schweizerische Sportsmittelschule students who attended the Pyeongchang Olympics came back with three gold medals, two silver medals, one bronze medal and numerous diplomas. In other words, six of Switzerland's fifteen medals went to athletes who have started out in Engelberg, Switzerland. If you are too old to train for the Olympics, Engelberg is still worth a visit for its extensive cross-country tracks, back-country skiing and snowshoeing possibilities. If you cannot train with the best, at least you can train where the best do.